We first clapped our eyes on Sony's just-launched latest picture frame TV, the beautiful Bravia EX1 featuring integrated High Definition wireless connectivity, back at IFA in August this year. The design is, well, like a lovely big picture frame – created specifically for the UK and European markets by Hirotaka Tako and his team of whizz-kid designers at Sony's Design Centre Europe. Tako explained to TechRadar that the design was inspired by the European's love of interior design and picture frames – something which just doesn't exist in Japan, due to their smaller living spaces and numerous other cultural differences. 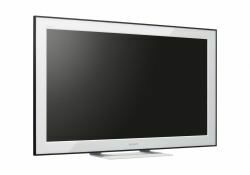 The Sony Bravia EX1 range is available in 40-, 46- or 52-inch screen sizes, featuring Sony's MotionFlow 100Hz technology, full 1080P high def, three HDMI sockets (built into the wireless box) and all the regular gubbins. The real USP, aside from the gorgeous design aesthetic (with the choice of finish in a luscious black or brushed aluminium thin frame) and the fact that you can just show it off with pre-programmed luscious high def pics and photos, is the aforementioned wireless HDMI connection. Sony promises us that "the wireless link is so fast, it can transmit the HD signal in real time with no loss of quality." The 50-inch Bravia EX1 costs £3,019, the 46-inch model £2,579 and the 40-inch model £2,288. Pricey, for sure, but every penny well spent in our opinion! Check back for the full interview with Sony Europe's Art Director, Hirotaka Tako, later this month.